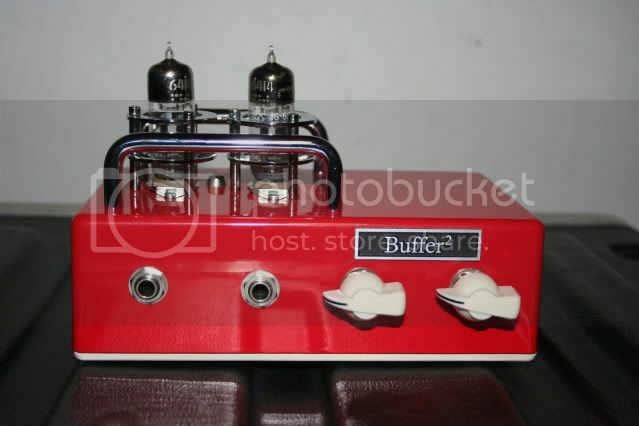 Paul Sanchez from Red Iron Amps sent me a Tube Buffer2 to check out. When I ran Line 6 and Vox modelers in the past, I ran the VHT Valvulator, Axess BS-2 and Radial Dragster in front/in back of those modelers and found it to be a VERY effective 'phat' effect adding greatly to the experience of playing those pieces of gear. There are some very deep and long threads here on this forum (still) from 2006 or so by me on those combinations. The Red Iron Amps Tube Buffer2 is a stand alone metal enclosed tube buffer designed 'to add the tube organics' back into your modeler's tone. It's a basic unit - two inputs, two outputs and two level knobs (in tasteful chicken head knobs). It sports two GE JG-6414 tubes. An industrial, computer rated dual triode,virtually the same specs as the E180CC or 7062. Unlike the E180CC, this tube was made in the USA. It is a more rugged build, with the Raytheon blackplate type sporting triple mica and military ratings. 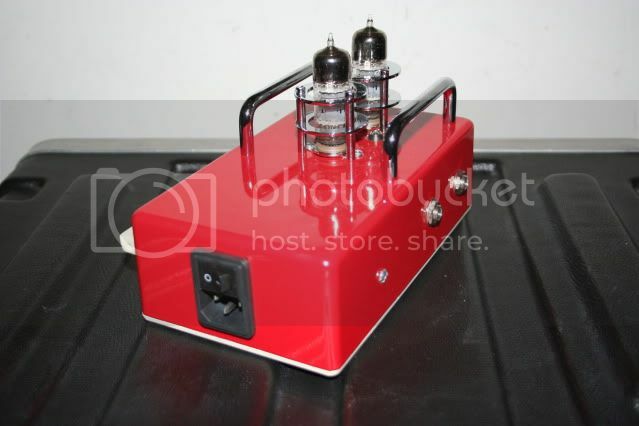 This tube is also like a 12AV7 and will work wonders in any 12AT7 spot, and may be just the ticket if you want to boost the gain of a 12AU7 circuit. The 6414 is getting very hard to find, but with a 10,000 hour heater rating you may never need a replacement. Discussion groups rate this type very highly for use in headphone amps. Stands about 1/2 inch taller than the standard 12AT7. Seems that Manley uses this tube in some of it's tube circuits as a buffer driver - so obviously, it's a known commodity and suited to the job at hand here! Aesthetically, the Buffer2 is a really nice looking stand-alone piece of gear. Notice that there's no power supply, just a IEC power cord with an on/off switch. The inputs and outputs are not marked, Paul sent along a color printout with the Buffer2 with the in/outs marked. There was no owner's manual. Didn't take much to figure out how to plug it in though. The tubes don't 'light up' like 12AX7's do; there's a blue LED behind them to let you know the unit is on. The tubes get warm, you can feel the tubes with your hands after using it for a while; warm... but not hot. I'd imagine - guessing - that they'd last a very long time operating like this. I built this Buffer2 because I'm a POD fan. I wanted a bit more tube "organics" and sustain. Frankly this buffer will work with anyone who uses pedals in their signal chain. You can use it before or after the pedals. Since it has low impedance output, you can also use it for home recording ANY musical instrument. The essence of the circuitry: 2-channels, Stereo volume and tone controls. Single input and output for each channel. All point-to-point, hand-wired. NO CIRCUIT BOARDS. NOS Allen Bradley resistors, Wima and Mallory capacitors. Teflon-coated silver wire. Sturdy and dense cast-aluminum chassis that also is impervious to RF noise. Internal power supply (no wall-warts!). Highly filtered plate and filament supplies makes for very quiet operation. The 1st stage of the 12AU7 is a low-gain amplifier. The 2nd stage is the buffer stage (low impedance). The LED has an inverted cone design that disperses the light 180 degrees around it's circumference. Turn your lights out! and you'll see how it illuminates the fins, shields and chrome grab bars. I don't have a mainstream-market modeler to try... I'm an Axe-FX guy. So let's see what it did with my Axe-FX. I used my Axe-FX and chose (after trying a lot of different tones) a Matchless-like tone that I use quite frequently as a 'go-to' gigging preset as the right way to best illustrate what the Buffer2 does to the sound. I tried it after the outputs of the Axe-FX and tried all sorts of gain staging between the output of the Axe-FX and the trim on the Buffer2. The Axe-FX has line level 1/4" outs, I ran those into the left/right inputs of the Buffer2 into my soundcard (Lynx Studios L22 interface). I recorded at 24bit 96kHz resolution straight into Reaper and then used the UAD Precision Limiter to match output volumes. I basically used the limiter to match the volumes to -0.3db output, if the limiter engaged at all, I backed off the gain threshold until there was 0.00db Gain reduction showing on the meters. All the guitars are with my Melancon Custom Artist (H/S/S - WCR Goodwood/SR/SR) guitar. For this comparison, I used the following signal path in the Axe-FX - amp/cab/reverb. No other processing was used (in the Axe-FX or in Reaper other than the aforementioned limiting). Control Take: I am very familiar with this tone from the Axe-FX, I use it all the time. 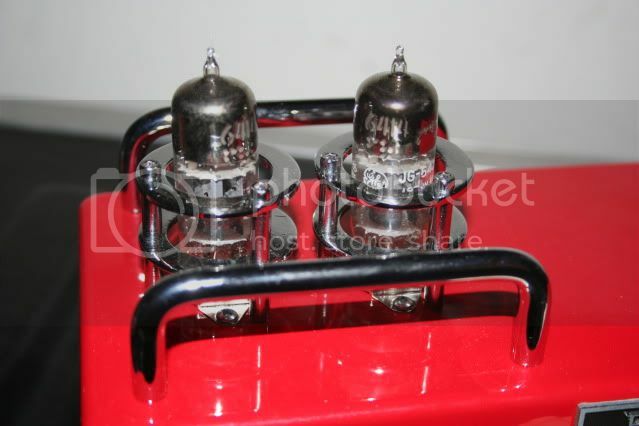 I have always liked the very clear top end, the chime without hash, the bottom full without mud. This is a great clean 'crushed glass' tone that I've favored since I owned my Matchless DC-30 and Clubman(s) (I had two of those). Comparing recordings of myself playing the Matchless amps to this tone in the Axe-FX, the Axe-FX holds up extremely well for my taste. Buffer2 After (7 o'clock): Interesting grit added, seems to 'clutter' or 'cloud' the clarity I like on the top. Definite color added, great as an effect if that's what you want. Grittier without too much mud. Buffer2 After (9 o'clock): I tried all sorts of settings; this is as high as I'd go for a clip... it's a lot of color added. I wasn't very enamored of what happened to the tone here, it's not bad or awful, but it just 'puffed up' what I like to hear from this tone, adding a gritty haze over the clarity I desire. Buffer2 Before (9 o'clock): I tried this configuration on Paul's suggestion. After hearing it on the outputs of the Axe-FX, I was somewhat skeptical of what I'd be hearing. I tried all sorts of positions on the trim pot, and looked for a nice 'sweet spot' in gain staging with the front end of the Axe-FX gain. I normally have the Axe-FX input gain at 2 o'clock with this guitar; I found that with the Buffer2 at 9 o'clock and the Axe-FX input at 11 o'clock I had found something special. Now this was a tone that I heard and felt really good about right away. In fact, I ended up playing for about 20 minutes instead of cutting the clip because I was digging it. It was slightly compressed, had more gain, yet really cleaned up with the volume knob on the guitar and had a wonderful phat tone. The feel was rounder, I could hit the strings harder and not 'blow up' as quick. I really dug this setup. Because it is a line level box, you could also use it as an outboard effect for mixing, and use this with most anything - keyboards, put drum mixes through it, well... anything to 'gain them up' with real tubes. So where do I end up with on this box? It's killer looking; just looks outstanding with the chrome tube surrounds, chrome grab bars, blue LED and it's Ferrari red attitude on your mixing desk. I like - very much - that you don't use a power supply with it. That is not an inexpensive way to manufacture gear, and I recognize that. 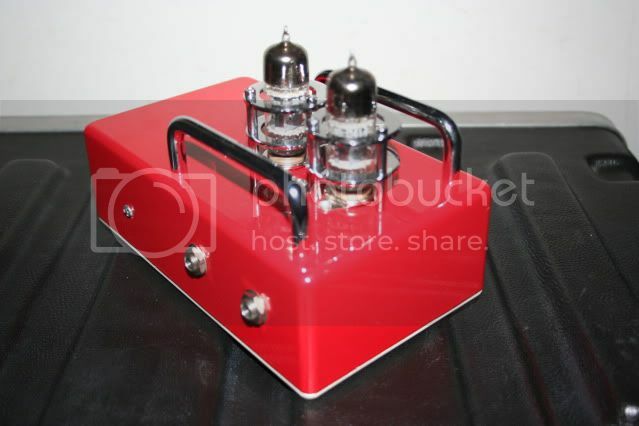 These run $399 and are only (as far as I know) available direct from Red Iron Amps. I really like what it did before the Axe-FX. I did not try it both before and after the Axe-FX at the same time (with the two channels) because I wasn't that taken with what it did when I used it and I recorded everything in stereo and the resulting signal configured this way would be in mono... which would not make for a fair A/B/C/D test. I was very impressed with what it did before the Axe-FX; given the level of gear that the Fractal box is... I honestly was digging what it did before the box. I want to thank Paul for letting me check this box out - and true to his word, he didn't ask me to review any of my comments before I posted them. He believes in his products and trusted me to give his box a fair review, good or bad. I hope I've hipped you guys to something that might interest you to check out further.